William Byron has already clinched three wins in the NASCAR XFINITY Series™ this season and at Kansas Speedway, he raced to a top-five finish with a new sponsor on board. During the Kansas Lottery 300, Byron’s No. 9 Chevrolet Camaro featured the logo and colors of VANNOY Construction – one of the leading commercial builders in the Southeast. Founded in 1952 and based in North Carolina, VANNOY Construction is one of the 30 largest private companies in the state. 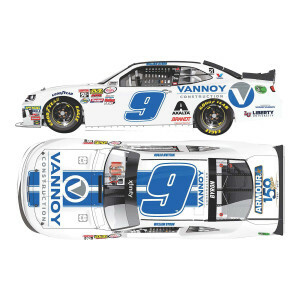 Now Byron fans can order the Action Racing Collectables die-cast of his No. 9 VANNOY Construction Chevrolet Camaro. Each 1:24-scale model features an opening hood, replica graphics, rolling Goodyear tires, and will be autographed by Byron.